A reward from Brewfest. a Wolpertinger is a small, rabbit creature with antlers and wings. except if they're really, really drunk. Wolpertingers are mythical animals from the forests of Bavaria in Germany. They typically have the body of a rabbit with an owl's wings, small antlers like those of a stag and fangs like a wolf's. The Wolpertinger is a ficticious animal that only the player sees while drunk. If you have full screen glow effects on, the Wolpertinger will appear only as a blurry fuzzball, making the player seem as if they are "seeing things." This is why other players cannot see it. i believe the name for the quest th get this is "catch the wild wolpertinger"
As mentiond above, this pet is perfect for PvP stealthing, the trouble with pets is that when you are stealthed the enemy can see about where you are. in acception to Egbert that will sometimes run around and the enemy cant exactly guess where you are, but still know that you are there, but while you have a Wolpertinger on, your enemy cant see you or your pet unless he is drunk and you can still enjoy your cute fluffy-feathery-horny-teethy pet. This pet is only visible when players are drunk. Just ran past a player who had this pet, I saw it although neither me nor he was drunk. So all you stealthers be warned. Try to click on it. It will make some cute sounds! Could you stop making these rumors (hmm... or maybe Blizzard changed something in new patch?)? I just have been with Warlock in Outlands who had this pet and I could see it with no problem. Also, I am 100% sure than I was sober, I didn`t drink any alcohol that session. Oh, that is even better. Must try it out. The Wolpertinger is viewable around the Brewfest camp outside of Orgrimmar when you are completely smashed, And a tip 'If you go into your video options and turn off all shader effects you lost the drunk effect (screen blur) its good if the screen blur gives you headaches etc. Have Fun! I can confirm that, while it is invisible to others, anyone in a group with you in either a party or raid can see it. Kind of have to wonder if this was made specifically for druids and rogues. With these though, only party members and enemy drunks (which is rare, and impossible in arenas) can see it. Anyone else think they sound like tribles (those things from star trek)? I've never really heard a Trible before (seeing as I'm no treky), but I can only imagine that this is how they would sound. You CAN see it in raids, drunk or not. Buddy had one out tonight and I could see, no drinking at all. looooool I just commented to someone that they sound like tribbles and here I see a comment about it. FYI - There was a bug with the quest in previous years, you are now able to buy the Wolpertinger's Tankard from the vendor for 50s. A brief history on Wolpertingers. You only need to be drunk IN GAME to see them. Now a purchased item (50silver) from the Brewfest Vendor. R u sure that this item can be bought on Brewfest 2008? I checked all NPC's near ORG and haven't found it. Purchased from Belbi Quikswitch (Alliance) or Blix Fixwidget (Horde) for 45s. Also, is visible to the owner w/o alcohol usage. How come i could see my friend's Wolpertinger when i wasn't drunk, and he could see mine too, and he wasn't drunk either? Is it because we both have them, so it exists for both of us? Just got mine for 47 silver and like 45 copper. I can see him at anytime but I could only see wild ones when I was drunk. Confirmed this cannot be seen by other players unless drunk. Summoned on a zeplin and no one could see it. Pulled out my Brewfest Pony Keg and told everyone to get drunk and they could all see it. I think this can only be purchsed during Brewfest (September 20 - October 4) as currently Larkin Thunderbrew is not a vendor and just says "A good club can make all the difference in the world." EDIT: Why was this rated down, is my comment inaccurate? I love this guy he's so cute and makes such cute little noises when you click on him.....most of the time they are cute anyways. No quest for it anymore. You just by it from the special brewfest vendor for 50s. Brewfest 2009 the pet can be purchased for 50s from the Token Vendor outside your capital city in the caravan. Dudee... i swear i saw a rabbit whit wings... and horns! I was able to do this quest (as well as the pink elekk one) on my server today (Fenris server). Drink ALL the booze you just bought and you will not only get the <Strange Brew> acheivement.... but you will see little Wolpertinger's running around.... They will be smaller blurrs running around... lol! You can either put the green net icon on your action bar, or just have your bag open. Left click on the small fuzzy blur and then right click on the net. Stand there a second or two... and woolah! Do this 4 more times and you got yourself a new companion (after you turn in quest)! Actually you can do both. I quested for one in 2008 and 2009. Both say Already Known and can't sell them. Might as well toss one of them. I wrote this little script line to go at the end of my stealth button macro so that it would unsummon my companion automatically (not using a gcd) unless it's my wolpertinger. It could be trimmed down a little(mostly by using the ID instead of the name), and it would have to be changed on characters with a wood frog, worg pup, yellow moth, or zergling, but I thought I'd share it if someone was looking for something to start from. Pretty sure this pet can be seen by everyone now, drunk or not. I was in a random group earlier and I was completely sober but I saw this little guy bouncing along behind the tank. No vendor found in 2011 yet, who sells the item. Is this pet still available, or have they removed it this year? Anyone know how I get this pet in patch 4.2? Maybe because of the new brewfest's item Pônei de Barrica da CervaFest ? Maybe it's here, but "hidden". Like this old bug that doesn't allowing the purchase of the item by the interface (because can't visible in the vendor list) but by a "buy" command ? It seems to be that you can only get this via one of the three dailies each day and you only have to be lucky to get this daily during the event. I've heard this little fella comes from the Baú do Tesouro com Forma de Barril which is dropped on your first daily killing of Coren through the dungeon finder. Interesting... Both ideas are probable, but what random dailies are there? and the one you get after defeating the dark iron invasion... Are there any more? This is correct :) Appearently it just got delivered a little late in comparison to the other goods. Is this forever if i byet it? 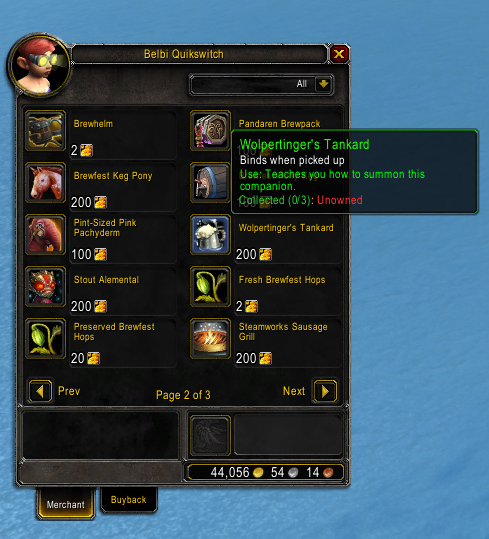 As of 2012 you can buy this item from one of the Brewfest vendors for 200 Brewfest Prize Tokens. If you already have three learned (because several toons have done this quest before), you can "Put in Cage" on of your old ones, learn this one, and sell the extra. In the window of the vendor it doesn't state that you have learnt it, even if you already have. The same goes for the Pint-Sized Pink Pachyderm. So if you are in doubt, double check whether you have it or not. Keep in mind this pet is cageable, so if you missed Brewfest you can grab it on the auction house. At the time of this post they go for around 10 gold on my server. It's also a pretty interesting battle pet. Here is a quick video showcasing it at level 25 if you want to see it in action before leveling it up. On my rogue when I have my Wolpertinger pet out, it no longer appears to stealth with me. It looks solid like any other pet, instead of translucent like it did when I first got it a few years ago. It's helpful to have Track Target turned on (tracking options button near minimap) and Enemy Nameplates turned on ("v" toggles). Companion, can do pet battle, you can have 3 copies of it. Avalaible from Belbi Quikswitch <Token Redeemer>, during Brewfest for 200 Brewfest Prize Token. Uso: Ensina a evocar esta mascote.